Wow, two posts in one day; I'm on a roll. I wanted to mention that I've been fortunate enough to have my shop chosen to be featured on two blogs that are helping promote talented and creative shops on etsy. The first is http://degdieblog.blogspot.com/ - she has such a great style and her blog is just as cute. Check out Ana Luisa's etsy shop, http://degdie.etsy.com/ and see the great cupcake girl bookmarks, for only $2.00 you can have a pdf file sent to you, all you do is print and cut. Super cute and fabulous! The other blog is http://quiltsgaloreandmore.blogspot.com/ - debbie's shop on etsy is http://boutiquepillows.etsy.com/ - she specializes in creating one of a kind personalized pillows and quilts and she has some lovely items in her shop. 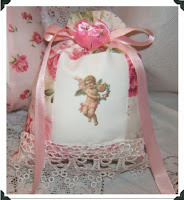 The Valentine Day Pillowette is just one of the oh so pretty items from her shop that you'll see when you stop by. Love your blog. Thanks for cross promoting!